The Millennial Freemason: Anyone Got a VSL?! Its with that wonder and mystery that I can say that a blank book is the BEST representation of the VSL, as in its emptiness, it represents everyone. On Wednesday a good friend of mine, a Muslim, will be initiated in our Lodge (and I will be delivering the Charge to the Initiate). We asked him whether he wanted to bring a Qu'ran to use during the ceremony, and he said that he was taught that he could swear an oath on a Torah, a Bible, or a Qu'ran, whichever was available, as all three were holy books in Islam. So he decided to be sworn on our usual VSL, the Bible. I think that is a good point as that is really the first question to be asked is on what VSL the candidate wants to swear. Sadly, I remember the ire that Rep. Ellison (the first Muslim member of Congress) received when he chose to swear the oath of office on a Qu'ran from President Jefferson's collection. I heard crazy things like "America is interested in only one book, the Bible" from radio show host Dennis Prager. I mean, you can disagree with the guy about his politics, and I know quite a few Minneapolis residents who do, yet I was struck by this vehement hatred for Ellison's choice of a Holy Book. It was this disgusting connection that if you are Muslim, you are supporting terrorism, which drives me nuts as I have Muslim friends who are every bit like me, kids just living their lives in America. Some Jewish members to Congress have, since at least Ed Koch, been swearing on the Tanakh instead of the Bible and I am okay with that preposition. Even then, Prager said that it was illegitimate to swear on the Tanakh. I am a believer in the Constitution and the influence that Masonic values had on the Constitution and when there is no religious test allowed of government employees (Article VI, sec. 3), I believe it comes from our Nation's desire to be tolerant of believers of any faith. For me, Freemasonry is about representing all paths to the Supreme Being and when a brother wants to swear an oath on his holy book, there is really no problem; if he would rather swear on the Lodge's standard VSL, he should also be allowed that choice. The swearing on the book with Holy significance is a way to show his sincerity of purpose to what he is swearing, not as an endorsement of one religion over another. In South Carolina, a tyled lodge must have a Bible open on the alter, however other VSL's can be included along with the Bible as needed. Since South Carolina is historically very Christian, this requirement should not really be that surprising. And much of Freemasonry's history in the United States originated in South Carolina, so again, this requirement shouldn't be too surprising. 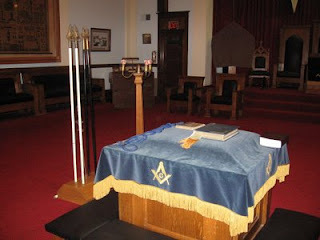 Going through the Blue Lodge in South Carolina, it's very easy to see Freemasonry as something Christian in nature. Sure, there are many South Carolina Freemasons who are not Christian, but the majority are, and it just seems to be a given because Christianity is such a big part of many people's lives. Let's also not forget that that much of Freemasonry's ritual and foundational philosophy (in the Blue Lodge, at least) is based on Biblical events, stories, and passages, from the Old Testament. And in the York Rite, both the Old and New Testaments are again foundational. So there is definitely some logic in requiring that a Bible be present for a tyled lodge. And as stated above, since the first five books of the Bible are the same books of the Torah, and that both the Torah and the Bible are considered sacred to Islam, again, the logic continues to follow. As to taking the various obligations, my personal opinion (as well as the dictates of South Carolina) is that one should obligate himself using the VSL to which he holds sacred. The point of an obligation is not to swear allegiance to a religion, but to instill upon the candidate the importance of keeping his word and the severity of the consequences (real or metaphorical) of breaking his word. Yes, Freemasonry is about many paths, but those paths start somewhere, and in Freemasonry, Biblical stories are fundamental to its core. Let's not forget that.